About a year ago, we received an email from Delta Hotels about changes to their Privileges program that were going to happen late in 2014. The hotel chain was also set to embark on a huge marketing campaign, change in marketing tactics and more all throughout the year. When late 2014 rolled by, Delta had opened their new flagship hotel in Toronto to much hurrah but the relaunch of the new Delta Privilege program never transpired. And now we probably know why. Who knows how long these two chains were in talks but we can wager a good guess that when things starting getting serious Delta put a hold on the revamp of their in house FGP. 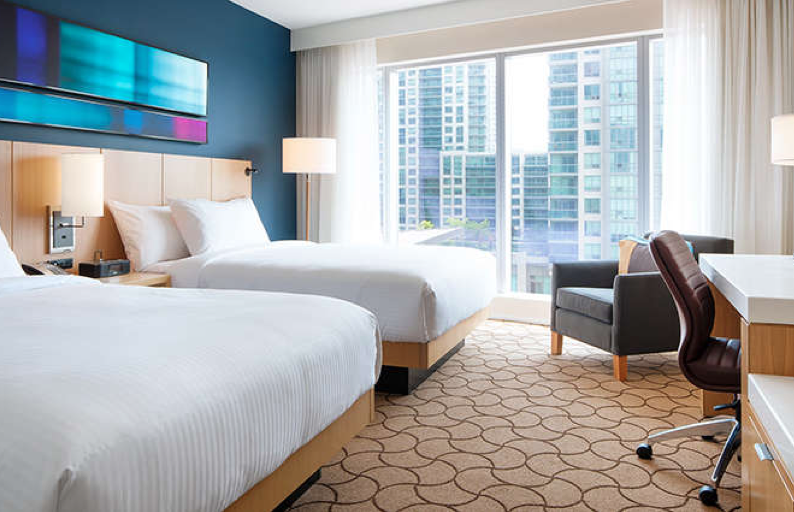 Now that it is official and Marriott is set to buy Delta Hotels, Marriott Rewards will eventually become the program of choice for one of our largest Canadian hotel chains. ...the integration of Delta into Marriott's 4,100 plus hotel global portfolio will provide new travel opportunities for both Delta and Marriott customers. We expect integrating Delta into Marriott's systems, sales engines, Marriott.com, and the more than 49 million member Marriott Rewards loyalty program will create meaningful operational synergies for owners and franchisees. What are your thoughts? We know there are lots of Delta Privilege members who read Rewards Canada everyday! Are you happy? Are you fuming? Let us know! Interesting. I don't collect many points from hotel programs as I tend to stay in boutique or one-off places when I travel but there's a Delta a stone's throw from my house. I assume that Marriott buying Delta will mean converting all Delta properties? Great news for Marriott Rewards members and Visa card holders, who can now leverage occasional stays at (former) Delta properties with stays at ubiquitous Marriott properties (especially in the US). And means more places in Canada to redeem and earn points! Delta has some very good properties, including the top hotel in several smaller Canadian cities such as Moncton, Fredericton, Charlottetown, Victoria, Kingston and St. John's. One more thing...I wonder if Delta will be integrated into the Marriott portfolio as a separate brand (similar to Gaylord Hotels), or if each Delta property will be rebranded and renamed under an existing Marriott brand (e.g. Delta Ottawa could become the Renaissance Ottawa). Not 100% sure if they will be converted. Gaylord Hotels and Protea Hotels which were recently acquired by Marriott are staying under their original brand names. Only time will tell as right now all they state is integration, nothing about rebranding. Totally agree, this is great news for Marriott Rewards members not only in Canada but those who travel to Canada and yes this gives an additional boost the Marriott Visa here in Canada. As I just mentioned below in another reply, only time will tell! Integration is such a broad term. Gaylord and Protea remain and I think from a marketing standpoint, especially for Canadians they should keep it as Delta as the name is well known from coast to coast. I personally enjoy the Delta Privilege program and the fact that Delta Hotels were a full service, top notch, Canadian owned properties. I am hopeful that they will remain Delta branded with the same great service (but American owned). I never could understand when a company buys a successful business, then makes a bunch of changes, and expect it's customers to stay loyal (the current customer base were loyal because they like the way the business was run). I can live with the Marriott Rewards for Delta stays but too many other changes and I'm prepared to move on. I would have to say that most of us here in Canada feel the same way as you Daniel! Well being both a Delta Privilege Platinum member as well as a Marriott Silver member, I have very mixed feelings. I guess first of all as we are already well into our stays for Delta for 2015, if the program changed would we receive credit for those stays. As far as programs go, I don't think they are comparible. Delta offers much more for their members than Marriott in Canadian Locations. Even when Marriott has upgrades available they are never offered to the customer unless there is a substantial cost. I was very sad to hear we could be losing our Delta program that we have invested in. I guess we will see.